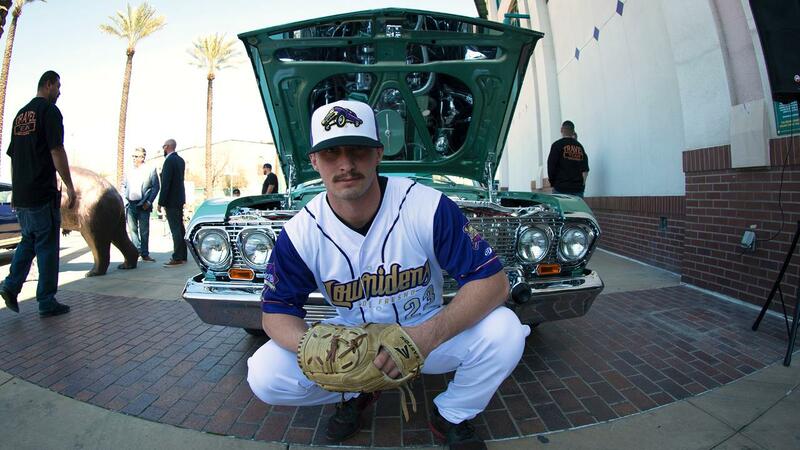 "Lowriders de Fresno" to take the field at Chukchansi Park in 2019; part of MiLB's "Copa de la Diversión"
Show cars, the "Sonny Madrid Award" and soon-to-be iconic Lowriders uniforms all a part of Fresno's entry into Minor League Baseball's "Fun Cup!" As part of Minor League Baseball's "Copa de la Diversión" (Fun Cup! ), a new-for-2019 alter ego, the "Fresno Lowriders" (Lowriders de Fresno) has been unveiled by the Fresno Grizzlies as part of the nationwide MiLB promotion. Clad in an eye-catching purple, black and gold color scheme (images attached), the Lowriders will take the field four times at Chukchansi Park in 2019 on June 15-16 (vs. Omaha) and July 27-28 (vs. Reno), in a pair of "Lowriders Weekends" in Downtown Fresno, presented by Tecate. The culture of lowriding, with its influence on art, music and fashion, is deeply rooted in the fabric of the Fresno Latino Community. Lowriding has been a part of California culture since the 1940s. Latinos redesigned cars to ride "slow and low." Paint jobs became mobile canvases to display artistic tributes to Mexican history and culture. Joining car clubs served as a positive and productive activity in Fresno and other California cities. Fresno's central location became a crucial hub in the growth of the lowriding movement. Lowriding began in Southern California but soon went national and even global with the birth of Lowrider magazine in the Bay Area. In its early stages, Lowrider magazine often utilized Fresno as the halfway point for lowrider car shows featuring the best cars from north and south of the state. Every Sunday, cars from all over the Central Valley fuel the lowriding tradition by cruising up and down Fulton Street directly outside of Chukchansi Park, the home of the Fresno Grizzlies. On June 15-16 and July 27-28, the Grizzlies will honor this tradition and culture by playing as the Lowriders de Fresno.